Every once in a while, technology comes along that helps us re-imagine the way organizations work. In this post, you’ll learn about a new branch of “Social CRM” called “Friend Discovery” that will make it radically easier to find your friends inside the organizations you care about. Friend Discovery services connect the Customer Relationship Management (CRM) database in an organization with the social networks of its customers and other stakeholders. It’s a relatively simple idea, and by the time you’re done learning about it in this article, I hope you’ll be as excited as I am about its potential. I hope too that you’ll begin finding creative ways to apply this idea in your organization. And for those of you in the tech sector – especially in CRM and and social networking, I hope you’ll take this idea and run with it; and that you’ll do that in ways that keep Friend Discovery as open as possible, in order to maximize its potential to unleash innovation, entrepreneurial energy and social benefit. This post builds on ideas outlined in a few earlier posts. You can definitely read it without that background, but you might want to go back afterward and look at “Are You Tapping Third-Order Engagement?” and “Re-inventing Collaboration: CRM as Social Technology” for more details on “orders of engagement.” For now, it’s enough to know that “third-order engagement” is all about customers and partners engaging other customers and partners in the work of an organization. To illustrate third-order engagement, let’s start with the hypothetical example of me loving some cool new gadget I just bought. Let’s say that the company behind the product makes it fun and super easy for me to recommend it to a bunch of my friends. Those recommendations are extremely valuable to the company because it’s much harder for them to reach these potential customers without me. I’m the bridge they need to reach my friends. From a technology perspective, this company can’t reach my friends without me because those relationships reside in my social graph. Put simply, the social graph is a record of the people I know, shared in some sort of database that makes it easy for me – and my friends – to update it over time. The goal is to create a representation of my relationships in that social graph that stays as up-to-date and dynamic as my relationships in real life. One of the big motivators for keeping my social graph up-to-date is that it allows me and my friends to use it to share stuff – like pictures, links, and status updates. In “Re-inventing Collaboration: CRM as Social Technology” I noted that “the systems we use to manage our relationships eventually transform into the systems we use to collaborate with those relationships.” Facebook, Twitter and the other social networks are where I ‘collaborate‘ with my friends because that’s where I keep my social graph. If the maker of that cool gadget I bought wants me to engage my friends on behalf of their product, they need to figure out a way to help me do that through my social graph. Today, the leader in exposing people’s social graphs in this way is Facebook; its platform is fast becoming a kind of social network utility, but it’s not without some real limitations. Let’s say I’m thinking about upgrading to the latest iPhone. In the morning, I go to the upgrade page on the Apple website and am automatically presented with a list of my friends who have already purchased the new phone. I can even filter the list to narrow it down to just those friends who upgraded from the same the phone I have. I pop a quick message to a couple of those friends whose technical opinions I trust most, and after a few back and forth messages, I’m convinced. That afternoon, I place my order for my new phone. There’s a hack for doing some of this using my social graph on Facebook. Putting Facebook’s Open Graph Protocol tags on that iPhone upgrade page on Apple.com makes it equivalent to a Facebook Page, which means I can “like” the page and I can see all my friends who liked it too. Don’t get me wrong. That’s a cool trick. But just to be clear, what I’m actually “liking” here is the web page, not the actual iPhone upgrade. My liking that page could mean lots of things. It might mean that I bought the upgrade and like it. But it might also mean that I want to buy it, or that I’m just a huge Apple fanboy who “likes” everything they do. The point is, “liking” a web page is very different from liking the object that that web page represents. Facebook doesn’t know anything about what I’m commenting on or “liking.” It’s just HTML text to their platform. On the other hand, Apple knows a heck of a lot about what’s behind that iPhone upgrade page, and much of that knowledge is stored in databases that could be very valuable to me as a customer – and even more valuable if I could connect it with my social graph. Facebook-based Social CRM integration is shallow because it only touches the HTML surface, rather than penetrating deeper into the underlying databases and the meaning they contain. This leads to another important limitation of using Facebook’s social graph. Just because I upgraded my iPhone doesn’t necessarily mean that I bothered to go to the iPhone upgrade page on the Apple website and “like” that page. In fact, if you really think about, only a very small percentage of Apple’s customers would ever bother to do that. They have better things to do with their time. 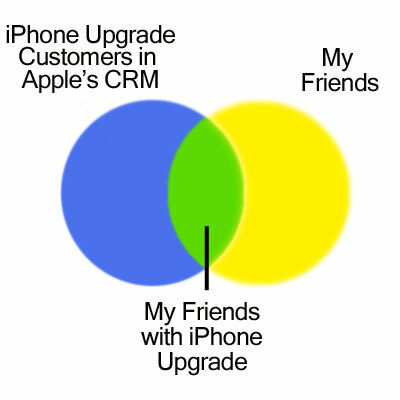 If I want to maximize the probability of finding friends who’ve purchased the upgrade, I’m better off relying on the records of everyone who’s actually purchased the phone – and that information sits in Apple’s CRM. Let’s now look at what happens when Apple is able to compare my social graph to their CRM records of everyone who has upgraded to the new iPhone. What I get is what I want: a list of my friends who have actually upgraded to the new iPhone. This is what the Venn diagram to the right represents. Here’s what I might experience as a customer. When I first set up my account at Apple, I’m prompted to choose from a handful of simple settings for sharing information with friends through my social graph. I can choose whether or not to share which products I own, my product support inquiries and other sorts of interactions with the company and its products. I can also choose to opt-out completely, of course, but then I won’t be able to see what my friends are sharing about their relationship with Apple. With my social graph now connected to Apple’s CRM, landing on that iPhone upgrade page instantly and automatically gives me a list of all my friends who have made the upgrade – and maybe even some of the support issues they encountered in the process. My friends won’t need to remember to share this information with me. That information is already in the Apple CRM and once that’s connected with my social graph I automatically find who I want, right where it makes the most sense in my interactions with Apple.Now that’s Social CRM magic! There are lots of different aspects of Social CRM, and I’ve tried to sort out its major attributes in a piece called “The Many Flavors of Social CRM.” What I’m describing here is a future branch of Social CRM that depends on a phenomenon I’ll call “mutuality.” Mutuality is what happens when two entities share something in common. Mutuality is the overlap in a Venn diagram like the iPhone example above. When I’m friends with Dave and you’re friends with Dave, we each refer to him as a “mutual” friend. Mutuality is the underpinnings of a whole bunch of interesting technological opportunities that arise from the intersection of various databases, and I’ll be exploring more of that in future posts. The focus here though is on what happens when we engineer the overlap of an organization’s CRM database and its customers’ social graphs. When organizations expose their CRM to their customers in this way, customers can easily find friends who share a connection to the company. That intersection is what I call “Friend Discovery” because it helps me find friends who also care about a particular organization and its products, services or mission. In funny way, you could say that makes the organization a “mutual friend.” We can now swap out the specifics of the iPhone Venn diagram above for something more general. When we do, we end up with two circles, “CRM” and “Social Graph” which now overlap in “Friend Discovery.” Friend Discovery gets most powerful when we start combining various cuts on the CRM database and the social graph to expose very specific intersections of friends with various types of relationships to the company. In the example above, it wasn’t just me and my friends with a relationship with Apple. Apple gave me a very specific cut of their database that just showed me its customers who had upgraded from my current phone to the one I am interested in. On my end, I might have also filtered my social graph to just my friends here in Seattle so I could buy a friend a coffee or beer while he’s helping me think about phones. Friend Discovery is a new category of technology. It includes modifications to CRM solutions and the way we manage our social graph. Ultimately, it will also include a whole new suite of “Friend Discovery applications” built into organizational websites and with ways of exposing themselves through our various social networks and through third party websites. This is powerful stuff, and as Peter Parker had to learn the hard way as Spiderman – with great power comes great responsibility. In the iPhone example above, Apple needs to be very deliberate in designing its Friend Discovery settings and the overall customer experience, making careful tradeoffs between business needs and the needs of customers. I’ve taken a cut at some underlying principles for Friend Discovery, but there is clearly much more work to be done on this front. My wife and I worked with a great architect here in Seattle last year on a remodel and I’m always happy to serve as a reference for their work. References always means a lot more when they come from someone you know and trust. So, wouldn’t it be helpful if people I know were automatically able to see I was a happy client when they visited the firm’s website? I may not want the details of our remodel out their for all the web to see, but I’m happy to share it with friends – and those friends shouldn’t have to know in advance to ask whether I was a client. That social connection should just be discoverable. Friend Discovery would enable that and those recommendations could be programmed so they’re automatically exposed to third-party directory and review websites like Angie’s List too. One way to help you think about how Friend Discovery could help reinvent your organization is to imagine giving your customers and other stakeholders a special flashlight that, when shined into your organization, instantly illuminates all the people they already know. With just a little creativity and good thinking, you’ll soon uncover all kinds of applications and opportunities to lower costs, increase income and strengthen your organization’s overall impact and value to customers and other stakeholders. Friend Discovery is a big idea. It radically increases organizational permeability, which is a very good thing. Thanks for making the connection here, Roy. I do know a bit about VRM, and there are definite connections to what I’m talking about here with Friend Discovery. Very complimentary, in fact, and I almost went into some of the connections in this piece, but it was already getting *way* too long. I’ll probably come back to those connections in another piece later. It’s interesting to think about extending people’s social graphs to include vendors, as one way of thinking about the opportunity I’m framing here. I still need a deeper understanding of VRM though. There is lots of interesting information locked away in company CRM and related databases that can bring a great deal of value to an organization’s overall value proposition – and I need to understand how that fits with it. It strikes me that one key to making this work without putting too much information in any one entity’s hands is to get a commonly accepted federated identify management rolling. This has been the buzz for several years now and Gartner now has it climbing the slope to its plateau in two years or less. Once something like that is in place, people could define their social networks wherever they want, including Facebook, and third-party CRM tools would know who you were when you took action in a CRM-ish way (bought an iPhone, got added to a staff listing at your new job, etc). Thanks Andrew. Agreed. Federation is good. I really like the way that WordPress is run as an example. I can use their blogging tool, hosted with them. Or I can take my marbles and move them to another hosting company. Still working on a follow up piece to provide a bit more implementation details on the Friend Discovery idea. This post was already getting too long. This sounds a lot like “Collaborator Discovery” invented by Hughes Research Labs in the 1980s!!! After some back and forth on Twitter, I now see what you’re referring to. 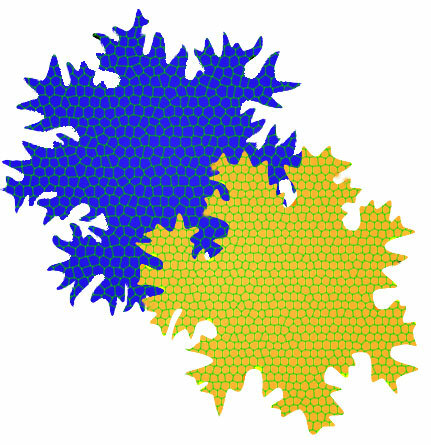 In a way, what I’m talking about here is very similar to the kinds of network analysis that you do with your clients. This is about baking that kind of intersection, or “mutuality” into some applications that help organizations and stakeholders collaborate in real time. But yes, I see the connection to the kind of networks analysis that you do. Hadn’t thought of that before, but it’s very relevant. Thanks for drawing that out.